6 Then the king’s countenance changed, and his thoughts troubled him, so that the joints of his hips were loosened and his knees knocked against each other. 10 The queen, because of the words of the king and his lords, came to the banquet hall. The queen spoke, saying, “O king, live forever! Do not let your thoughts trouble you, nor let your countenance change. 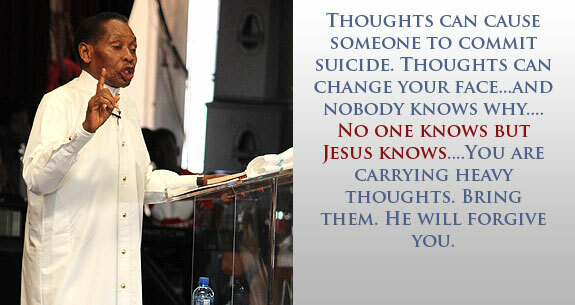 Thoughts can cause someone to commit suicide. Thoughts can cause a person who had a good life to become sick. Thoughts can change your face. Thoughts can cause you not to settle and no body knows why. Thoughts can cause no peace from what you've done. Thoughts can cause you to do what you are running away from. Your face keeps changing. Those thoughts have cause demons to enter your life. Thoughts can make your life short. Today its your day, you can bring your thoughts to Jesus and be healed. No one knows but Jesus knows. You confuse people, you blame people but its because you are suffering front your thoughts. You've given those thoughts to your children. You think you have bad luck at work. It is not God's will for you to live like that. You are carrying heavy thoughts. Submitted by Takudzwa Chibuda on February 1, 2014 - 22:19. I needed this word,God bless you Baba. Submitted by Anonymous on January 24, 2014 - 04:05. Submitted by Anonymous on January 17, 2014 - 14:23. Submitted by Anonymous on January 7, 2014 - 10:41. Submitted by Anonymous on September 8, 2013 - 16:49. Submitted by Anonymous on August 30, 2013 - 13:18. Submitted by Anonymous on July 30, 2013 - 10:23. Submitted by Anonymous on May 30, 2013 - 11:29.